Phone cases are one of the most exciting things about getting a new phone. I like to buy something decent that I fall in love with so that it will last me a little longer. They are pretty inexpensive compared with how much a phone actually costs and it's a really fun way of adding some sort of design to your phone while protecting it at the same time. I always thought I'd be the kind of person to chop and change my phone case all the time as there is just so many designs out there, but that's actually what stops me. I find it really hard to find something I love that I won't forever be seeing attached to someone else's phone. I like a bit of originality, me. That's where Society 6 comes in and I have been obsessed with the site ever since I got my first iPhone all those years ago. Society 6 is essentially a site that features a tonne of designers and you can get their prints on things like phone cases and pillows. I fell in love with the site and scrawled through until I found the designer Amy Sia and since have been obsessed with her prints. They're super bright, super interesting and so cool. 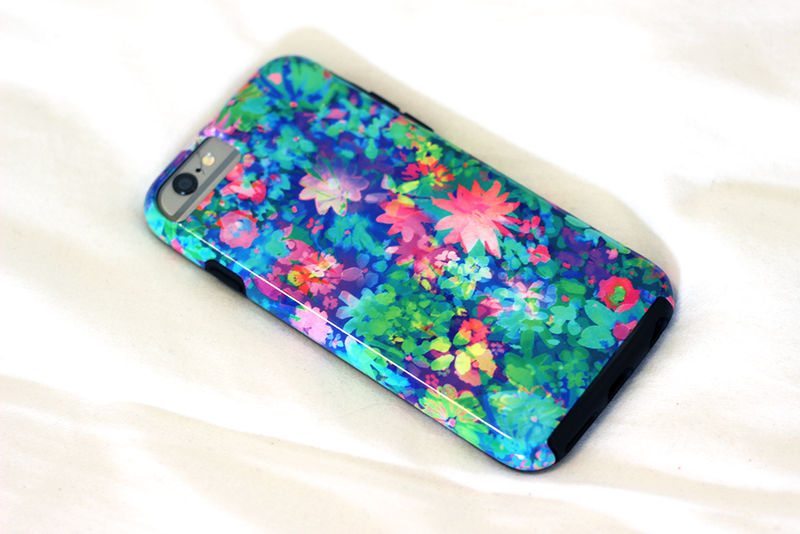 I had the Geo Gem iPhone Case design on my first iPhone and now I've got the Fluro Floral iPhone Case. Her designs are so stunning that I felt that it was worthy of its own post. The phone case is sturdy, protects my phone and I've never experienced it breaking like I hear with other cases! I've only ever had 1 case for each phone and I just can't see that changing any time soon. If these designs however aren't your kind of thing, then I'd recommend checking out the rest of the websites designs as there's so many different things. What a lovely phone case! I love changing my case up every couple of months, you can find some super inexpensive and very cute ones on Ebay!